The Ladykillers probably had the most complicated set ever for Compton Players. With three levels, plus a roof revealed by sliding panels, and a gauze front curtain made opaque or transparent by the lighting (described by the NODA critic as ‘a stroke of genius’) it was a challenge for the set builders and the actors. We’re lucky to be able to start set construction three weeks before the performances and to rehearse on the stage as the set takes shape around us. Even so, we were changing the lighting right up to the last minute but as always it was alright on the night. The sound and lighting was pretty complicated too and we were really happy with some great sound effects set up by Tony, our sound and lighting man. Here are some of the things the critics (from ODN, the Newbury Weekly News and NODA) said: “excellent sound effects and choice of music… a well performed play, enjoyed by the enthusiastic audience… good timing and movement… an evening of joy… the audience went home with smiles on their faces”. The audience reaction was excellent too: “Congratulations! A terrific performance… I was amazed at the scenery… please tell the actors how good they were… a great show and the most imaginative set… thoroughly enjoyed the show last night, well done to all the cast… the set was particularly well designed given the constraints of your stage… I thoroughly enjoyed the play and look forward to the next one… loved the play tonight, you all did a brilliant job! It was a great set too. Well done to everyone involved”. 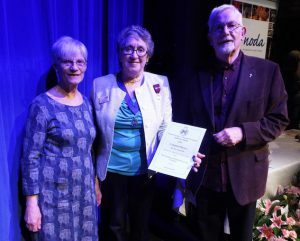 24/03/2019: in January we were nominated for a NODA South East Region Award! It’s in the Best New Show category for our production of The Promise and Murdering at the Vicarage last year. At the awards ceremony, we were runners up – congratulations to H Connolly who wrote both plays and directed The Promise and Eric Saxton who directed Murdering at the Vicarage. Here’s a picture of Liz and Eric picking up the award! The Promise and Murdering at the Vicarage have finished their November run (details and reviews here). Innovations for this production were more LED lights (to get the blue wash for the ghost) and The Amazing Missing Marbles in the form of a standard lamp, lovingly created by Dave Hawkins. We’re now into rehearsals for the second play by H Connolly for our autumn production, Murdering at the Vicarage. This play was originally written in 1991 as our entry in the Wallingford Drama Festival (where it won the Punters’ Prize for best play) and it’s about an amateur dramatics group called Compton Players rehearsing their production of Murdering at the Vicarage for the Wallingford Drama Festival!